Carol Service Spreadsheets - Here you can access the King's College Festival of Nine Lessons and Carols spreadsheet; this document tracks all of the carols sung at this service since 1997 and also an increasing number of earlier years for which we have found information for the service. I wrote an article about this yesterday, but my editor said it was tl;dr. Here's the cool kid version. You can listen to a live broadcast recording of the 1962 Festival of Nine Lessons and Carols on Spotify. The service was directed by David Willcocks. Here's what to listen for. 1. The opening hymn: "Once in royal David's city"
Notice anything? Yes, it's the right hymn. Yes, it begins with a treble solo. But, wait, where's the descant? There isn't one. The famous Willcocks descant may not have even been written yet. It bears a copyright date of 1970, eight years after this service took place. 2. The words really do rhyme in "God rest ye merry, gentlemen"
In the hymn "God rest ye merry, gentlemen" the word "wind" is sung to rhyme with "mind" in the lines of the third stanza, something which is not done at King's (or anywhere that we know of) today. I would never tell my choir to sing it that way. Nowadays you really have to have your radio cranked up to hear the very soft pitches given by the organ before the choir sings. But not so in 1962. The organ plays the first phrase to remind them exactly how it goes, and the registration isn't always very subtle. The organist introduces the hymns in the typical way. But when it comes time to sing the organ plays a chord a full beat before the singing begins. Every time. What is that about? 5. The lovely carol "Born in a manger"
It's not a carol you know. You probably haven't heard it before. It's not a carol that anyone seems to know, and I don't think it's been sung very much since 1962. I believe it was written by Christopher Morris (1922–2014). 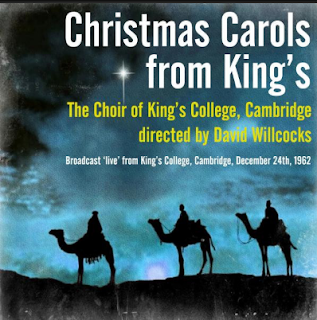 Maybe others are already aware of this, but we were delighted to stumble upon a recording of the 1962 Festival of Nine Lessons and Carols from King's College, Cambridge. This is a live recording of the service on that Christmas Eve more than half a century ago. The director of music at that time was David Willcocks. The recording called "Christmas Carols from King's" and is available on Spotify from "Digital Gramaphone". We are not sure about it's availability elsewhere. One of the first things to jump out at us is how much the conventions surrounding hymn playing and singing have changed. There is no descant on the opening hymn, Once in royal David's city. Willcocks's descant bears a copyright date of 1970 in Carols for Choirs 2, the same year that book was published, so it is certainly possible that he hadn't conceived of it yet. Even after a rhythmic introduction to the hymns, the organist gives a one-beat "gathering chord" at the start of each stanza of the hymns. This is not a practice that we have heard anywhere else, though we don't often listen to liturgical recordings from English collegiate chapels from the 1960s. We are not sure if it was common to accompany hymns this way, or if this was a convention developed for this broadcast. It is certainly a bit odd to listen too, especially when the left hand enters with the tuba for that marvelous Willcocks descant to "O come, all ye faithful". In the hymn "God rest ye merry, gentlemen" the word "wind" is made to rhyme with "mind" in the lines of the third stanza, something which is not done at King's (or anywhere that we know of) today. The organ also plays brief introductions to the carols, something that is not done nowadays. In terms of the carols, a standout to us was "Born in a manger". The Spotify information does not include composers, but with a bit of sleuthing we hypothesize that this carol was written by Christopher Morris, who you might know as the editor of much music published by Oxford including A Sixteenth-Century Anthem Book. "Christopher Morris, who has died aged 92, was the inspiration behind Carols for Choirs, first published in 1961 and later extended into four volumes, which, in the words of the composer John Rutter, 'changed the whole sound of Christmas for everybody who sings'." If anyone deserves to have contribution to Anglican Christmas music recognized at contemporary Carol services, Christopher Morris does. "Born in a manger" is lovely, brief, and quite effective. It seems to us utterly shocking that 1) we don't know the full picture about what music was sung at services like these in Willcocks's time 2) that a piece as good at this one is now almost completely unknown and unrecorded. Why has it not been sung recently? This brings us to the final phase of listening to this recording, which is placing the music in its liturgical context. Thanks to this recording we know exactly what the carols are (with the exception of composer of "Born in a manger", which we hope to confirm very soon). Since the readings are not included, we are left wondering at the precise placement of the music. First Lesson: God tells sinful Adam that he has lost the life of Paradise and that his seed will bruise the serpent’s head. Second Lesson: God promises to faithful Abraham that in his seed shall all the nations of the earth be blessed. Third Lesson: The prophet foretells the coming of the Saviour. Born in a manger - Christopher Morris? Seventh Lesson: The shepherds go to the manger. Eighth Lesson: The wise men are led by the star to Jesus. Ninth Lesson: St John unfolds the great mystery of the Incarnation. Hymn: "Hark! the herald-angels sing"
As it is our care and delight to await the coming of the 2016 King's College Festival of Nine Lessons & Carols, we must in heart and mind review the music list for this, the most famous regularly occurring church service in the entire world. Where possible we have included links to recordings on YouTube sung by King's. After the first lesson comes the music of two women. First, staple of this service, and then a piece by a composer whose music has never been sung at this service. "In dulci jubilo" by Praetorius. This lovely macaronic carol is heard almost annually, either in this early setting or in the "carol-fantasia" by Pearsall. In the past nineteen years it has been omitted only three times: 2002, 2011, and 2013. After the third lesson another composer has his moment in the King's spotlight. Sussex Carol by Brian Kelly. Again, the familiar names of Willcocks and Ledger are skipped in favor of a setting of this carol by a composer whose music has not previously been heard at this service. The name Brian Kelly will be familiar to many Anglican church musicians, though we cannot say that we know of this carol setting. After the fourth lesson the familiar carols return. Here we have two crystalline contrapuntal carol structures that are consummate Christmas compositions. We particularly want to mention this connection to Cleobury's first service because this year marks his 35th year at King's. One cannot help but wonder if he might be starting to think about stepping down, and in what way this music list could reflect a farewell to a tradition he has done so much to sustain, cultivate, and enliven. "I sing of a maiden" by Lennox Berkeley. Berkeley was the first composer to take part in a series of annual commissioned carols for this service. Berkeley's commissioned carol in 1983 was "In wintertime". In this service we hear his earlier, more familiar, more simple "I sing of a maiden" (Recording of "I sing of a maiden;" though please allow us to say that we think the splendid "In wintertime" is underperformed). ...There is, however, a completely over-the-top descant at the end that performs a little trick. The organ rises up the scale, and the trebles sing aah aah aah on the top four notes of an Ab-major scale. Then, when they repeat it immediately afterwards, the G is flatted, followed by the F, and then a G-natural: it’s very subtle, but it lines up perfectly with the text below “…to see her own son Jesus Christ to wear the crown…” “” what you expect is, of course, the crown of thorns, but the word that you get is “heav’n” (to rhyme with Seven). That little turn in the trebles is precisely the Tart Joy of Christmas: you have to make sure that you advance the clock to Good Friday, looming just a few months later. After the sixth lesson something old and something new. Then follows the commissioned carol, This Endernight by Michael Berkeley Lennox Berkeley's son. "Michael Berkeley composes Christmas commissioned carol". King's College. 3 November 2016. The final two hymns of this service after the ninth lesson are as predictable as the very first.